Neighbors of the project at 71 Salisbury Road say the excavation has impacted their properties, and they did not receive notice. 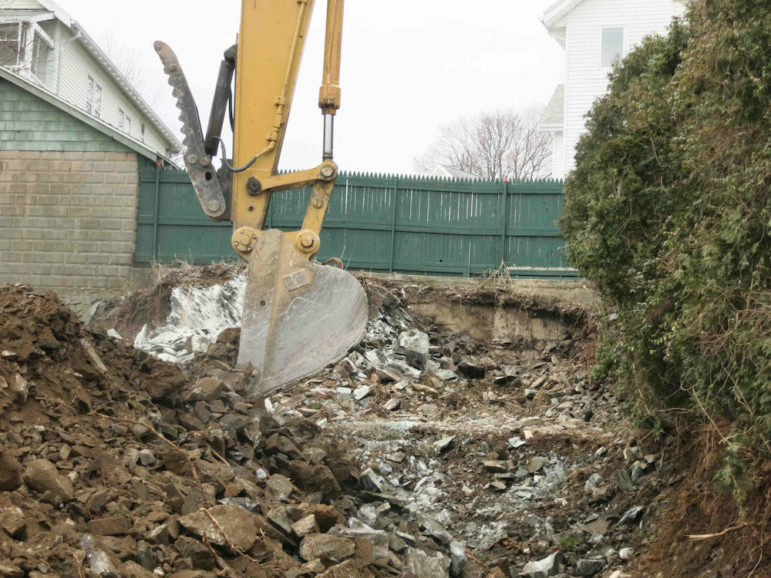 The major excavation for a single-family home on Salisbury Road has drawn the ire of neighbors, and now the District Town Councilor, who questions how the work was allowed by Town officials. 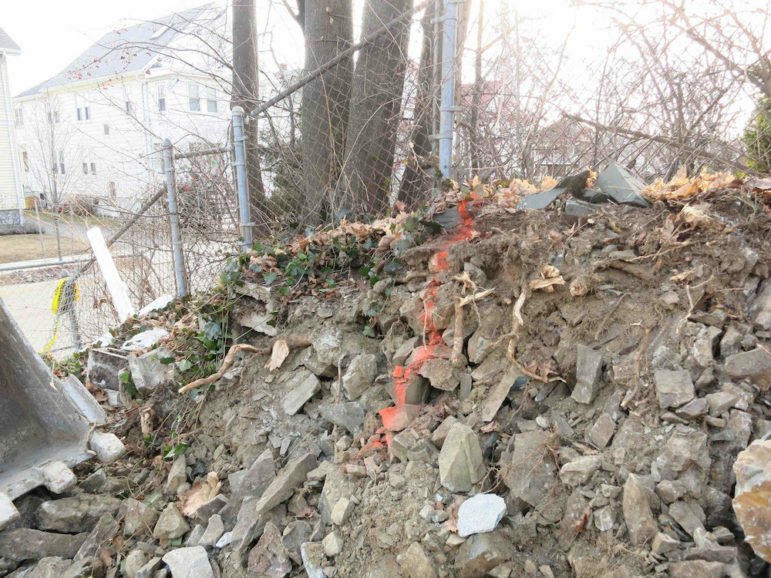 Last week, residents alerted the Town Council to the work being done at 71 Salisbury Road, including a major excavation of bedrock which took several days and damaged the roots of trees and shrubs on neighboring properties. The property was purchased in August 2015 by Eamon Fee, one of the developers of the parcel. The Town issued a building permit in August 2018 for a single-family house, which is allowed “by right,” so the project would not have to get approval from the Zoning Board of Appeals. When the permit was issued, the developers wrote to then-Town Building Inspector Ken Thompson, who had expressed concerns about the seismic activity from excavation during the project. In the letter, Fee wrote that the excavation would not be to the street level, but would only be enough for the foundation. He also wrote that he planned to send letter to neighbors or have a community meeting to discuss the project before the work began. Neighbors Libby Shaw and Jonathan Kresch said that the excavation has been significant, has taken several days, and that they never were contacted by the developers. Efforts to contact the entity that owns the property, 71 Salisbury Road, LLC, have not been successful. Assistant Town Manager Steve Magoon, who also heads the Community Development and Planning Department, wrote to the Town Council saying that he had been in touch with the developers of 71 Salisbury Road, and with his staff. Town Councilor Angeline Kounelis, in whose district the property lies, voiced her concerns and questions in a letter to Town Manager Michael Driscoll, Magoon, the Town Council, the developers and others. She said she was bothered that the developer did not follow through with a promise to inform neighbors of the project, as well as the fact that the project had been OK’d by the Town. “Even sadder, Watertown’s Team lacked the courtesy to inform anyone of the project’s magnitude; under the cloak of following procedure for a ‘by right’ Building Permit that does not require notification … To say that I am disappointed in the process, is an understatement.,” Kounelis said. She also had some questions about the Town’s oversight of the project. “What structural conditions have changed on the site to allow for negation of Mr. Thompson’s apprehensions?Who dictates thatauthorization for removal of centuries old bedrock, that has anchored almost 100 year old structures on Templeton Parkway, be granted without prior open dialogue with the abutters? Who is liable for monitoring the structural integrity of abutting properties during and after the construction process for stress cracks, shifting and possible soil erosion?” Kounelis wrote. Roots of trees on properties abutting 71 Salisbury Road have been damaged by the excavation on the site. Residents have complained that the project was allowed to go on without supervision of the town, thus endangering neighboring properties, but Magoon disputed that assertion in his letter. Another unfortunate part of the project, Magoon said, is the damage to trees on other properties, but some steps have been made to require the developer to remedy the situation. “The Builder was required to hire an arborist who has visited the site and has advised the builder as to what actions should be taken to best protect the survival of the trees. He will provide a written report as to his findings to the Building Inspector,” Magoon wrote. Thank you for this update on the 71 Salisbury issue, Charlie. As abutting homeowners, my husband and I sincerely share Councilor Kounelis’s concern about lack of adequate town oversight of the extraordinary extensive excavation of this property. This neighborhood is hilly, and we’re just uphill from this development. We’re deeply concerned about the potential long-term effects of removal of many, many tons of bedrock and sediment just below our retaining wall and garage foundation, and immediately below the foundations of the property of our Templeton Parkway neighbors. It seems to us that Watertown should never have allowed this extent of excavation without written documentation from a certified engineer that it was safe. We would like to see an engineer’s certification be required before this project can go forward. Regarding the damage done to our Salisbury Road neighbor’s beautiful maples by this extreme excavation job: these healthy trees are a huge benefit to the whole neighborhood — including any future occupants of 71 Salisbury. The trees are on the south side of the property and provide significant summer cooling. Like the trees’ owners, my husband and I very much want these beautiful neighborhood trees to be preserved if at all possible. However we’re very much concerned about these trees’ future if it depends on the capabilities of the arborist Mr. Fee hired to inspect them. If you want the best chance at saving a tree you hire someone with a strong track record saving trees. There are arborists who have well-earned reputations as skillful tree preservationists. There are also arborists who clearly specialize in tree removal. We and our neighbors who own the tree wrote to Mr. Fee several times expressing our concern for preservation of these trees. We explained the importance of hiring a firm with a strong tree preservation reputation and recommended two such firms. Judging from the arborist’s website and on line customer comments, Mr. Fee instead hired a tree removal specialist. Given Mr. Fee’s broken agreement with former Building Commissioner Ken Thompson regarding establishing communications with neighbors, given Mr. Fee’s documented misleading statement regarding how much excavation would be done on this property, given the assurance Mr. Fee and his partner gave our neighbor that his trees would not be harmed, before then doing considerable damage to the trees, and given Mr. Fee’s ignoring the neighborhood’s wishes to hire an appropriate professional to assess the damage to these trees… This developer’s behavior and the anemic public support Watertown has provided to this neighborhood have engendered a lot of bad feeling. It’s commonly understood that developers are generally not good neighbors. They promise and promise, then ignore any requirements not nailed down legally (and dance around some that are) in order to maximize profit. Then they sell, wipe their hands, and move on to the next opportunity to make a killing. Mr. Fee and his partner certainly fit this mold. Is it not a responsibility of our Department of Planning and Community Development to protect Watertown neighborhoods from the excesses of developers? If so, where are our protectors? I really enjoyed reading your well-written comment. It touches upon concerns we all have as residents of Watertown but are especially concerning to nearby residents and abutters. The building department REQUIRES notification at least 10 days before work begins, stating that “notice-of-intent must be sent to all abutters, by Certified Mail, to alert them of the commencement of the work”. The developer must verify that this was done in the application. Clearly, fraud was committed. This also violates Building Code (IBC c. 33, §3306.10) as well as Watertown ordinance. If you could, please write a similar letter and get your neighbors to sign it, and send it to the Building Department and the state Office of Public Saftey and Inspections. Pursuing legal action is also an option. I would love to help you, your husband, and your neighbors in any way possible. After seeing several photos sent to me in Florida, I’m much more concerned than I was after seeing photos sent to me about a week ago. The fact that I can see the base of my retaining wall which was the foundation of my garage, tells me that Mr. Fee has gone well beyond his property line. I can remember years ago when I had our property surveyed prior to having a section of concrete wall installed so that we could actually have a level back yard, our property line went beyond the garage foundation that is now serving as part of our entire retaining wall. The property lines extend about 12 – 14 inches beyond the walls or about the same distance as the garage roof overhangs and gutters. If the Town authorities are truly overseeing this project they should be smart enough to see this fact. I see problems in the future and the problems most certainly will involve Mr. Fee and the Town of Watertown. This looks like a horrible situation with serious ramifications for these neighbors. Unfortunately, it’s been obvious that our Dept of Planning and Community Development should be renamed without the word “community”. Over the last decade, I have seen no evidence of Planning from this Department either. Maybe just the Department of Development? Bottom line is the town is caught between a rock and a hard place. To stop work at this point could mean further trouble for the abutters. Leaving the property to sit for months again, in its current state, would be foolish and potentially disastrous. The whole project has been mishandled from the start with the town assuming the developer would do the right thing by communicating his intentions with residents promptly and with transparency. I would like to ask Mr Magoon if there are records detailing the progress made on the project during each of Mr McLaughlin’s visits to Salisbury Rd. As a note, Fee relisted the property for sale at $495K over the past weekend. I have seen the site. It is two blocks from my house. I must agree with those who feel that the Town officials have failed to protect the interests of the citizens who pay their salaries. It is time to change Watertown’s government to a system that is more accountable to the voters. Charter review is coming. If you feel that the Town has not been responsive to citizens’ concerns about development, zoning and land use, then you must get involved. Fred, the property has been listed for sale since August 2018. Yes, but he upped the price over the past weekend and re-listed it with his agent. Fee really wants to sell this plot and he is now trying to recoup his expenses. At a purchase price of 320K, he now hopes to net 495K.